China’s youth once trundled across the countryside spreading communism. Now, they’re spreading God’s word. Last year I was invited by another priest in the Diocese of Tennessee to give a series of reflections on “changing Christianity” during their parish retreat. I enjoyed it a lot. Part of what I spoke about was the changing demographics of Christianity around the world. Technically speaking it has been incorrect to talk of Christianity as a “western” faith for quite a while, but we are finally beginning to catch onto what that means. One big barometer of change are the increasing numbers of Christians in China, now thought to outnumber the official membership of the communist party. When I was doing the research for my presentation, I found estimates claiming that, should current trends continue, there will be approximately 175,095,000 Christians in China by 2025 and that they will make up around 12% of the population, making China the country with the third largest population of Christians in the world, behind the US and Brazil (because of the sheer size of China, the same number is obviously a much smaller percentage of the population). Some analysts predict that China will have the worlds largest population of Christians by 2050. The question is, what will an economically powerful China with a large Christian minority look like? What will be the ramifications for Christianity itself? To put things in perspective, most historians I’ve read place the percentage of Christians in the Roman Empire at the time of legalization under Constantine, to have been between 10-15%. We know the major influence Roman culture had on the development of Christianity… what will the Chinese influence be? There are obviously many positives (from my perspective) in this news, but there is also the troubling matter of nationalism wrapped in theological garb which seems to be hinted at in at least some of the comments in the interview. Is it any worse than “God bless America?” I don’t know, but given the propensity of Christians to claim chosen status for their nations at various points in history (Rome, the Byzantines, English, Germans, Russians to name a few–all have claimed divine sanction for their policies and wars) it is something we need to be aware of. 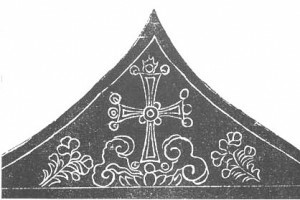 So, what do you think, what might be some of the contributions of a surging Chinese Christianity? We are fast approaching another birthday. Not my birthday or your birthday (though perhaps yours is close as well), but the birthday of the United States, the anniversary of the adoption of Declaration of Independence, appropriately called Independence Day. This Fourth of July will mark the two hundred and thirty fourth year since the declaration was adopted by the Continental Congress. Two hundred and thirty four years is a respectable amount of time. It may only be a drop in the bucket in terms of length of existence compared to some nations, but it’s definitely a good amount of time for a people to live under a democratic form of government. Our cultural roots in North America may not extend so far into history as some other nations, for instance, in Europe, but our stability as a republic is unmatched. Not only that, but we have many accomplishments and freedoms to celebrate. The honoring of individual liberty is part of the DNA of the United States, and through its influence, this trait has been shared with or expanded in many other nations. In recent years some Christians in attempting to shine a light on some of the unhelpful ways the Church has accommodated itself to the culture, have pointed out an unhealthy link between certain patterns of thought masquerading as Christianity, which serve to prop up negative versions of nationalism or to blur the distinction between the Kingdom of God and the United States of America. In an attempt to combat this “Constantinian” turn, these folks have called attention to the ways in which Americans, like the English, Germans, Russians, Holy Romans and Byzantines (pick a country) before us–and contemporary with us–have sometimes justified wrongful national ambitions and actions in religiously steeped language. Since all of these have been culturally Christian nations, that language has often taken the guise of Christian speech. This is a helpful critique, and one that we should always be mindful of–all nations (indeed, all human institutions and every one of us individually) have a drive to self-justify. And yet we should not let a drive to prevent the baptism of national vices stop us from appreciating the fruits of a hard won and costlily preserved Godly liberty. And I would argue that one of the positive things we Americans have inherited and expanded from our English forebears is a conviction that freedom is a gift of God, and that freedom rightly exercised is a virtue both private and civil. The line that all Christians must walk is the one that recognizes our status as resident aliens, citizens of another country first and foremost. The Lordship and claims of Christ subvert and overcome all earthly claims and yet, I would argue they are not necessarily opposed to all earthly claims, helping us to prioritize and–at our best–become loyal citizens, patriots and ardent critics of our nation. This is the line that Christians have had to walk since Constantine made the faith a licit or legal religion–I might repurpose the term and call this the “Constantinian line” that Christians have to walk. You see, it’s rather easy to determine one’s relationship to a state that is hostile to your beliefs, and the New Testament is clear: be good citizens and follow the law unless it conflicts with your faith, then be willing to die for Jesus. It’s a much more difficult situation to define one’s relationship to a state that doesn’t persecute, but even protects you and your right to worship. This is the tension that our Christian forebears had to deal with, as they went from a position of being persecuted, and therefore withdrawing from public life, to one of being a legal–even an official–religion and then called upon to take up roles in civil affairs that they had never participated in before. The way that Christian communities have chosen to walk this Constantinian line is one that has helped define them throughout history. There have always been more sectarian groups that looked with greater or lesser degrees of skepticism on the claims of the state; the Anabaptist tradition is one example (think of the Amish or Mennonites), as are some forms of revivalism and holiness traditions. Anyone who has seen the old movie “Sergeant York” will have seen an example of a revivalism committed to Christian non-violence come up against the claims of the state (and, we can tell from the title, how things played out). Movements, like individuals, have changed their stances over time–the Assemblies of God, for example, were officially pacifistic until the 1960’s. Our own tradition, as Anglicans, has been less skeptical of the authority of the state, and, sometimes to our detriment, more willing to work with the nation (England, and later the United States among others). On the positive side though, our refusal to absent ourselves from public life has meant that we have attempted to fulfill a calling to act as a conscience to the nation, calling it back to its own best principals, celebrating triumphs and mourning failures. It is this role as public conscience that I would argue we as a body of Christians are called to exercise, and in large measure this is most helpfully and fruitfully realized when we as individual Christians take up our roles in civic life as Christians, guided by the moral compass of our faith and calling our leaders–and ourselves–to account to the “better angels of our nature.” This is where the true heart of Christian patriotism resides, not in justification of every act of the state, but in the love of neighbor that extends out to the love of home and nation. These words echo very well the call of the Collect for Independence Day, which asks that we be granted the grace to “maintain our liberties in righteousness and peace.” On this two hundred and thirty fourth birth day of our nation, let us give thanks to Almighty God for the many gifts and blessings he has bestowed upon our homeland, lets take this day and celebrate, enjoying the freedoms that have been won and held at so dear a cost. And let us also, as faithful followers of Christ, exercise our calling to be in the world, not to retreat, and to work to make certain that this great and virtuous nation has not yet seen its greatest or most virtuous day, and that it remains one nation, under God, indivisible with liberty and justice for all. 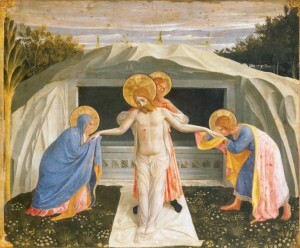 The Real Meaning of Easter? (From Internet Monk. I post this with a caveat because I think it highlights a real danger in quarters of American Evangelicalism–not so much among Episcopalians, we probably have the opposite problem. However, I’m not a big fan of going after folks for what they didn’t say. I also think that Easter *is* a great time to invite folks to church for two reasons: those who have been away may have an itch to return, and it’s a good time for those who come from non-Christian backgrounds to hear the central message of the Christian faith). It strikes me every year that the liturgists who authored the Prayer Book Liturgy for Palm Sunday wanted to discourage long sermons. More than any other service, the message is communicated at the level of the gut, viscerally. Very little interpretation or explanation is required beyond simple participation in the service. A service which leaves us, intentionally, at a moment of great despair, there to linger for a week reflecting on our role in the events that transpired. And I don’t simply mean our role in the liturgy, obviously, but our role in the events that the liturgy and the readings recount. 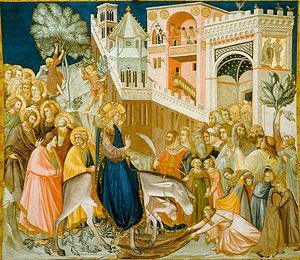 In the Liturgy of the Palms, we stand with those who welcomed Jesus‘ entry into Jerusalem with loud “Hosannas” and cheers and rejoicing. Standing with them, crying out with them, we’re reminded what it feels like to finally have that log awaited desire fulfilled. To see our most hoped for reality come to pass. The Messiah has come! The King who will restore the land to its rightful people. The one who will settle accounts, restore good fortune, put to right injustices and bring people into line with the sword. Hosanna! we cry, connecting with the joy they felt, believing that the day of the Lord they had always envisioned was coming to pass, that the Kingdom they assumed God would establish was being called into being. Finally. after all these years. It’s time to celebrate. To lay palm fronds at the feet of the one who comes, of the Messiah we’ve been waiting for. But then, something happens, and the Liturgy forces us to confront a sad reality about the great throngs that greeted Jesus at the gates of Jerusalem, and about the great throngs of people who have lived and died on this earth in all the years since. We transition, with the crowd, from shouts of praise and Hossana, to the Passion Gospel where we cry out “Crucify him!” We learn, through participation, that the people who cheered so mightily at Jesus’ entry into Jerusalem, cheered just as mightily for his crucifixion when they realized that this was not the Messiah that they wanted or expected. This Jesus. He was not the Messiah that they expected and this kingdom he announced… it was not a kingdom they wanted any part of. And so they turned on him to protect what little they had, to guard the things they loved, the things they loved which they thought were dedicated to God, but for which they would crucify God. And we’re there with them. We’re put there with them by the liturgy, because we’re there with them in spirit so often in our day to day lives. Today and throughout Holy Week we’re called to examine our relationship with God. To examine what exactly it is we’re hoping for, why exactly it is we claim to follow this carpenter from Nazareth. We’re called to seek within ourselves any evidence that we have, like the crowd, decided to shout “Hosanna,” because we have created a Messiah, a God, in our own image, because we have looked forward to the establishment of a kingdom governed by a law of our making. We’re called to look with fresh eyes at Jesus and the message of his Gospel, and decide again whether it is a message we can handle, whether we’re willing to continue the hard work of changing our expectations and casting off our selfishness and prejudices in order to truly welcome the Kingdom that even now is coming more and more into reality. We’re here today, as well, to be reminded of the times when we have said “Crucify him,” by our actions. To be reminded of the times we have rejected the truth and message of the Gospel by rejecting what it means for us and for all people. 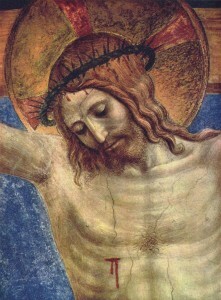 We may never have gone so far as to consciously reject or renounce Christ. We may never have participated in a “de-baptism” ritual, such as have become popular among atheists in England these days. Be that as it may, I would go so far as to say that all of us have at some point done something so out of conformity with what Jesus would have us do that we might as well have shouted those words while he stood in front of that crowd. Our service today invites us to remember that, at least as much as any of the actions of those actually present in Jerusalem at that time, our sin, our need for redemption, placed Jesus on the cross. We may well ask ourselves which role we play in this human drama. Do we test God, Jesus, the Spirit in terms of “What is in it for me?” The crowd did. Do we resent the way the Faith accuses us and wish we could silence Jesus, as Judas hoped? Do we run from Jesus and hide behind self-preservation? How ironic it is that the religious leaders and most of the disciples acted from self-interest. The Chief Priests convinced themselves that an unholy murder was justified to safeguard the institution. The disciples perhaps convinced themselves that if the work was to continue, they should protect themselves from arrest and punishment. What Aristotle believed could only come by law and justice, as Christians, we know can come only through Grace. Living well means saying yes to grace. Palm Sunday with it’s liturgy is here to remind us that we all move back and forth on that continuum, that we all say no and we all say yes. The challenge of the Christian life is to say the yes more and more and the no less and less. If we are looking for hope in today’s bleak retelling of the Passion and death of Christ, it is that when we recognize our complicity in evil, we do not have to stay there. We are not finally condemned. Just because we may find ourselves resisting the saving will of God, that does not mean it is not saving. And that is good news to hang onto as we mark the way of the cross this Holy Week. In the return of Christ to Nazareth where he had grown up, we see an example of what it can mean for God to get specific. In terms of his identity, Jesus is the incarnation of the Word, the second person of the Trinity and thereby conveys the character of God (2 Corinthians 4:6). 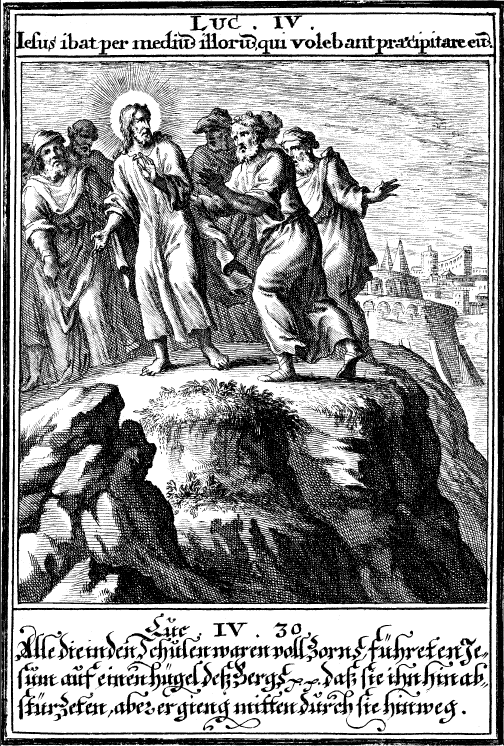 One of the things that Jesus does continually throughout his ministry is to challenge those who believe themselves to be faithful, calling them to examine the content of their faith and make an honest assessment of whether they have truly been following the spirit of the law as well as the letter. The challenge presented by the character of God revealed in Christ is a bit more than a critique of the pious loosing their way, it is a challenge to one of the fundamental ideas that many of Jesus’ listeners had held onto their whole lives, i.e. the idea that God’s grace and mercy is extended first and primarily–if not solely–to the people of Israel, and specifically, for some folks, only the religiously fastidious among the people of Israel. In this situation in Nazareth, the people are appreciative of Jesus’ interpretation of the text from Isaiah, until he gets to the point of revealing two separate but related points. First, He is going to do no miracles in Nazareth, his home town, because he does not expect that they would be received by the people there, “Truly I tell you, no prophet is accepted in the prophet’s hometown” (Luke 4:23). Secondly, expanding from the particular to the more general, he emphasizes the times in Israel’s history when the grace of God has been extended beyond the bounds of the people of Israel, even as some among the chosen people suffered. It is at this point that the people become angry, run him out of town and decide to throw him off the cliff. The people aren’t so much angered by any implication that they are sinners (though there are plenty of occasions in the Gospels when that becomes a sticking point), as they are angered by the idea that the grace of God might be active outside the boundaries they recognize or impose. So how does this relate to the tendency Hauerwas points out? The people of Nazareth may have been prepared to hear of their failures and sins–the ways in which they could have been more faithful in keeping the Law–but what they were fundamentally not prepared for was to be challenged in their perception of God’s grace and care. They were angered not only because Jesus illustrated his point by talking about people from the history of Israel who had not been healed or saved from their circumstances, but because of the fact that foreigners sometimes experienced God’s aid when Israel did not–it was a challenge not simply because of the seeming randomness of divine intervention, but because God’s grace was not as limited as they believed it to be. In the end it was not a pronouncement of judgment, but a pronouncement of grace that caused the people to want to throw Jesus off a cliff. This is often still the case. The survey cited by this CNN article was conducted by Pew Research and indicates that regular church goers are 12% more likely to support the use of torture (in what circumstances is beside the point) than non-church goers. The Creedal Christian thinks that “Perhaps this sheds some light on why many of the unchurched think Christians are hypocritical and that the Church is irrelevant and/or espouses unacceptable values.” I think he may be correct. It also demonstrates that that Church in the United States is not doing the job we’re called to…. unless you believe the job of the church is to inculcate an unhealthy nationalism and concurrent means of self-justification. And there is a difference between nationalism and patriotism. Unhealthy nationalism is the sort of thing that leads to the belief in the “my country right or wrong” principle while true patriotism leads to a commitment to serve your country in part by calling it back to its truest ideals. There has been a lot of response to this survey, not the least of which has pointed out that the margin of error was nearly enough to account for the discrepancy between church goers and non-church goers. Additionally, the sample was fairly small, with under 800 people surveyed. But regardless of whether more church going Americans think torture is justifiable or not, shouldn’t our concern be centered on the fact that far fewer Christians, if any, should believe this way than the general public? A government decided to execute a prisoner who threatened its control of a region. It did not just kill the man, but selected, as usual, a means calculated to do the most pain and prolong the suffering. His torturous death is recorded in the Gospels and should give every Christian pause in supporting any form of torture. Torturing any man, even the most base, may not elevate the victim, as it did with the Son of God, but it almost certainly debases the torturer to the level of the Romans who killed Him. Torture of any human being is incompatible with the Christian faith. This should have been obvious, but like many hard and inconvenient moral lessons it was not. Christianity grew in cultures that used torture frequently and so had cultural assumptions inconsistent with their faith. Like most evil things, torture is justified by the good that can come of it. Most bad things are tempting because of alleged goods, but Christian experience shows that any gains from torture are not worth the cost to the souls of men and cultures. Because there are times when torture seems like a good idea, Christians followed the practice of most ancient cultures and sometimes used it when they gained power. However, it was always a difficult decision for Christian civilizations to make and always had critics amongst Christian theologians and philosophers. The practice was modified and prisoners were given greater rights. The longer Christians thought about the practice and experienced the results, the broader the disdain and condemnation for it. Eventually, a consensus developed in the traditional Churches that torture was a temptation to do evil, a snare of devils to corrupt souls, and a delusion that promised good, but only certainly did evil. The condemnation of torture is part of the culture of life so central to the Faith. It is sad to see some Christians use arguments and lines of reasoning to justify torture that are similar to those used to justify abortion. Traditional Christians disdain those who mutilate the corpses of enemies, because it dishonors the Image of God. How much worse is it to mutilate the living body or the immortal soul of a man? Most Christians are not pacifists. They will honor the choices of a man who declares himself their enemy by fighting him in fair combat. Once he is a prisoner, they will honor his God-given free will by allowing him to preserve his conscience. Christian nations developed rules regarding interrogation that allowed prisoners to preserve their dignity and God-given choices. A Christian can kill a man who is asking for it, but he will not warp and twist his body and soul when the fight is done. Sadly, Christian history reveals that the “good reasons” for torture tempted many Christian leaders to torture in order to do some hoped for good. We don’t have to guess at the bad results or the later condemnation of history for our short-sighted pursuit of immediate gain over our deepest principles. Men have always been tempted to torture to get information to “save the city.” However, experience showed that saving the physical city by destroying its values was never a good bargain. At the very least, a nation that ordered torture had to turn some of its own sons into torturers. There has proven no way to compartmentalize such men after the alleged good they did was done. A nation that turns its bravest and best into torturers instead of warriors has dishonored itself. There are worse things than losing a war and that is one of them. Last week, however, I heard a voice of American pop-evangelicalism speak in contradiction to Mr. Land. As I listened to local radio pundits discuss the release of the torture memos by the administration, and debate the merits of prosecution, a listener called in and began his statement with the words “I’m a born again Christian, but that has nothing to do with my response to this question. Yes, I would torture.” I could only laugh and mentally thank the brother for being such a wonderful witness to the faith by prefacing his comment with that statement. I’m sure our Lord, along with George Washington, is proud. So, how can so many Americans who claim to be Christian be OK with torture? The answer is simple: they are using a simple form of pragmatic or utilitarian moral reasoning to come to their conclusions and not ethical reasoning based in the Christian tradition or scriptures. I’ve written about this issue before in reference to some comments made by Elizabeth Edwards about embryonic stem cell research. In that post, I commended a comment made by theologian Stanley Hauerwas as a memorable tool to quickly determine whether something passes the smell test for Christian ethics. Evidently Hauerwas was once asked to discuss the ethics of embryonic stem cell research, and to reply to the arguments of someone who spoke in favor of such research. Inevitably, as is always the case in such discussions, the hoped-for goods that could possibly, maybe, someday come from such research where trotted out as justification and defense. Hauerwas cut the gordian knot with the remark, “If it were discovered that foetal tissue were a delicacy, could you eat it?” As well as being memorable, the remark highlighted the distinction between the sort of default utilitarian thinking that governs much of our ethical decision-making in this country, and traditional Christian morality which sees an evil perpetrated in the service of a good as nothing more than an evil which taints any good that might come from it. In contrast, the sort of superficial utilitarianism that governs public discernment of such matters is usually predicated on a calculus of “if we do this then we will save X number of lives.” The problem with such thinking is that it neglects two important aspects of life: sin and tragedy. Utilitarianism often neglects the sense of the tragic because it refuses to see a necessary decision as a possitive evil. Likewise, it often refuses to consider notions of sin because it sees anything done in the service of utility as necessarily a good. These reactions are two sides of the same coin, the first of which I wrote about here. Of course, none of this means that the United States is obliged to abide by a Christian ethic, but at least we should expect Christians to strive to do so. It is, of course, a difficult thing to do, and can bring about disagreement (expected and welcomed), uninformed criticism (bearable) as well as giving rise to a sort of patronizing paternalism (very irritating) that sees Christians as the naive and eccentric relative who must be protected from their own fantasies. Be that as it may, at least our response in such a situation might have something to do with the state of our immortal soul. In other words, maybe being born again ought to have something to do with how we answer this question as Christians. I appreciate these comments from Fr. Greg Jones at the Anglican Centrist, where he takes professor Bart Ehrman to task for something C.S. Lewis used to call “chronological snobbery,” as well as some cultural bias. The sad thing about Ehrman is that his academic work is useful (we used some of his work on the New Testament in my history of Christianity class in college, and it was well presented and informative), but it is now being overshadowed by a series of sensationalist books that reproduce the same old schtick about there being contradictions in scripture, Jesus not being considered divine in the earliest Christian community (of course, one has to leave Paul out to demonstrate that, as well as disregard some pretty blatant stuff in the synoptic Gospels–John was not the only Gospel writer to view Jesus as divine, despite what Ehrman claims). Which gets to Ehrman’s entire problem: he continues to define the meaning of the phrase “understanding the Bible” in terms of the rationalistic, historical-critical, skeptical methods of the modern West — even though the Bible was not written, edited or even now largely read by persons who share that hermeneutic. Factually speaking, the recent discoveries made by scientists have not been of things never before known. No, much of what has been done is to restore a degree of familiarity with the languages and contexts of the ancient world which — well — the ancients were totally familiar with by virtue of being alive then. To put a plain point on it — the knowledge of Scripture that Paul exhibits, for example, when he wrote his own letters (which would become Scripture themselves) is of a degree that I seriously doubt whether Ehrman could even come close. Paul, after all, is likely to have been versant in biblical Hebrew, as well as Aramaic, Greek and Latin. As a trained bible scholar — a Pharisee — Paul probably had committed the Scriptures to memory to a large degree, as well as a large oral tradition, and he would have been exposed to manuscripts far more ‘original’ than any Ehrman has ever seen. Anglican Centrist: Bart Ehrman’s New Book – Greg Jones Comments. I’ve just formatted another of my papers, this one on the mission of the Church, for wordpress. The paper references two books in addition to the Bible and the Book of Common Prayer. One is the Open Secret by Leslie Newbigin, the other is The Future is Mestizo by Virgilio Elizondo, a Roman Catholic. As you will be able to tell from the paper, I favor Newbigin’s approach. In The Open Secret Leslie Newbigin puts an idea into words that has been the heart of much Christian activity in history, namely that “a church that is not ‘the church in mission’ is no church at all.”1 This statement is not so much condemnation as observation; that it is possible for us to hear it as condemnatory speaks volumes about our particular shortcomings as contemporary Christians. To say that Christianity is a missionary religion is nothing new-it has long been categorized as one of the three great missionary religions, along with Buddhism and Islam. There is a difference however, between saying that Christianity is a missionary religion and in stating that it is essentially missionary in character. A religion might become missionary through circumstance or accident-or it can be missionary in its very essence and character, as Christianity reveals itself to be. The missionary character of the Church is rooted in the life and work of Christ and it is here that the Church finds its authority. Because the Church derives its authority from Christ it is natural that it derive the basic structure of its mission from Christ’s ministry. This is a situation both liberating and restrictive. It is restrictive in the sense that anything done without the intent of glorifying God or bringing all things into subjection to Christ can not be considered within the scope of the mission of the Church. It is liberating in another sense because of exactly how much and how great a diversity of things can be seen this way. Ethical discussion: a slip of the tongue? Get Religion and Touchstone have each directed attention toward a recent interview former president Bill Clinton gave on the subject of embryonic stem cell research in the wake of President Obama’s changes to embryonic stem cell research funding. During the interview Clinton repeatedly refers to a fertilized embryo as though there were such a thing as an unfertilized embryo. As I posted on Touchstone’s site, I’m willing to give Clinton the benefit of the doubt that he actually knew what he was saying and that he really meant “implanted.” But whether he merely mis-spoke or he actually doesn’t understand the basics of biology, I believe his interview is indicative of a problem we have as Americans: a basic inability to discuss important ethical issues because so many of us have absolutely no clue what the heck we are talking about. I might give Clinton the benefit of the doubt and say that he probably knows the difference between fertilized and implanted–but there are a ton of other folks out there that I wouldn’t assume that about. Of course some folks are assigning nefarious intent to Ole Bill, saying that he’s intentionally muddying the waters. I don’t know about that, but I do want to know why no follow up questions were asked to help him clarify what he was trying to say. Update: First Things has some commentary as well.